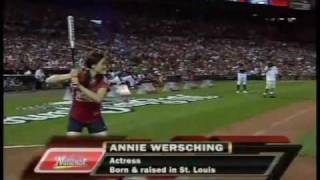 Part 2 of Annie Wersching on KSDK St. Louis July 14, 2009 talking about her participation in the 2009 Taco Bell All-Star Legends and Celebrity Softball Game, how she landed her 24 role, and more. Art Holliday: Well it’s my pleasure to introduce my special guest this morning, actress and native St. Louisan Annie Wersching. You’ve seen her on Boston Legal, Cold Case, Frasier, General Hospital, the movie Bruce Almighty, and most recently she was FBI Agent Renee Walker helping Jack Bauer save the world on last season’s 24. Thank you so much for getting up early this morning and joining us. Annie Wersching: Thank you for having me! Art Holliday: Lot of pressure helping Jack save the world? Annie Wersching: A little bit, a little bit. Not quite as much as playing in the softball game last night. Art Holiday: More pressure in the softball game? Art Holiday: What sort of All-Star activities other than the softball game have you been taking part of? Have you gone to any good parties? Annie Wersching: We saw Nelly and Chuck Berry last night, that was very exciting. Went to the home run derby, going to the game tonight… I’m just excited to be involved and seeing any of it. It’s so exciting and so cool for St. Louis. Art Holiday: Dare to say you’re a Cardinal fan? Art Holiday: Do you have a favorite Cardinal moment or favorite player? Annie Wersching: I would say any backflip of “The Wizard” [Ozzie Smith], he’s up there. Including the somersault from last night. Art Holiday: What can you tell us about Kiefer Sutherland that 24 fans might be surprised about? Annie Wersching: He’s an avid chess player. Art Holiday: Oh is that right? Annie Wersching: That’s what he does in-between takes, I don’t think that’s something people would imagine. And he also has a recording label, he has his own recording label with a lot of bands that he manages. He’s got his hands in lots of other little things. Art Holiday: And people may not realize when you’re on the set of a movie or TV show, there is a fair amount of downtime. What do you do? Annie Wersching: There’s a lot of downtime. I tried to learn to play chess, that didn’t go very well so I moved on to other things *laughs*. Art Holiday: Now you said you went to the home run derby last night. Annie Wersching: It was really exciting, it was weird at first realizing that there wasn’t actually a game that was gonna be played, but it was really exciting, really fun, fascinating. Art Holiday: Of course every year this time, people debate whether the All-Star game should decide who gets home field advantage in the World Series. You have an opinion you’d like to share? Is that a good idea or not? Art Holiday: Well done! *laughs* So what’s next for you, what other projects are you allowed to tell us about? Annie Wersching: Well we just actually started filming season 8. So I’m involved with the next season of 24. We’re about four episodes in, so just kinda getting going, getting geared up. It’s really different, it takes place in New York this year. Lot of new stuff going on and Agent Walker is up to all kinds of stuff. Art Holiday: Earlier in the show we had a piece that Mike Garrity did with you yesterday, and you talked about the fact that you were a fan of 24 before getting chosen. Art Holiday: How did that happen, how did you become a part of it? Art Holiday: Well good for you. And good for the world, because you’re helping keep us safe! Art Holiday: Annie Wersching, thank you for being a good sport this morning. Welcome back to St. Louis! Annie Wersching: Thank you, thanks for having me!